By John Hertz: Progress Report 3 from Dublin 2019, this year’s World Science Fiction Convention (the 77th! ), tells us Kevin Roche will be the Masquerade Director. The Masquerade at an s-f con, once a dress-up party as its name implies, developed decades ago into an on-stage costume competition, with lights and sound and who knows what. Wonders appear. It typically outdraws anything except, at the Worldcon, the Hugo Awards themselves. They are our most important event; the Masquerade is only our most spectacular. Kevin Roche, a Master-class costumer, has directed Masquerades, notably at Renovation the 69th Worldcon (with Andrew Trembley), and chaired the 76th Worldcon (called simply “Worldcon 76”; some get names, some don’t). Applause to him for so soon taking on such a demanding task – as with other things at our conventions, it’s like herding cats – let’s face it, here in the Imagi-Nation we’re seldom the best organized of folks. I’ve known Brother Roche for years and had various adventures with him. He knew the job was dangerous when he took it. It’ll be a grand Masquerade – that is, if the people who think this artform is fun, or who’d like to find out, show up and take part. Which we shall. The Dublin 2019 Masquerade E-mail address is masquerade@dublin2019.com. I don’t see any paper-mail address for it or the con in my otherwise-handsome copy of PR 3, which just arrived. So you can write to me if you wish. 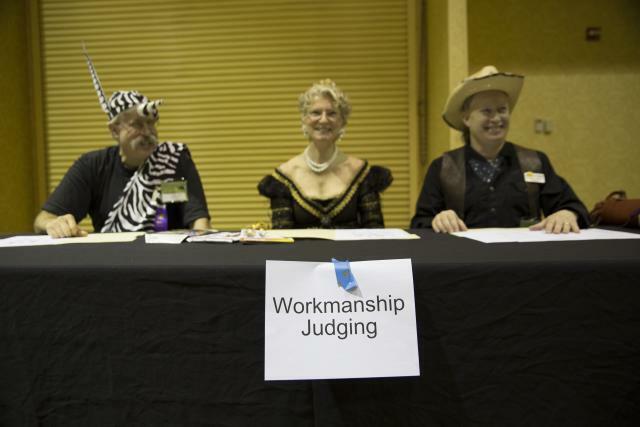 I’ve been a judge or Master of Ceremonies at lots of Masquerades; recently I was a judge at Worldcon 76, you can see my report here; I’ll help you get in touch. My paper-mail address is public, 236 S. Coronado St., No. 409, Los Angeles, CA 90057, U.S.A. This entry was posted in Worldcon and tagged Dublin 2019, John Hertz, Kevin Roche by Mike Glyer. Bookmark the permalink.